Go to original pattern for design DROPS 98-39. 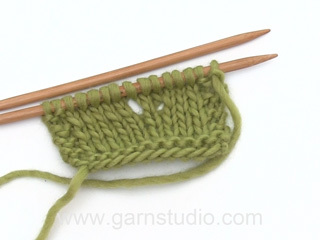 DROPS circular needle size 8 mm / US 11 or size needed to obtain the correct knitting gauge. 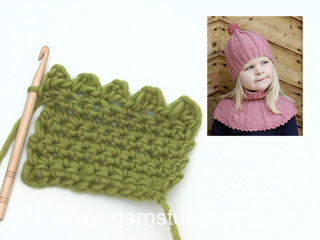 DROPS STRAIGHT NEEDLES size 5 mm / US 8 or size needed to obtain the correct gauge. 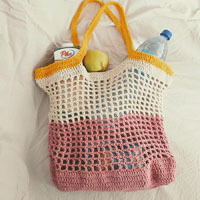 Knitting gauge: 10 sts x 16 rows on needles size 8 mm / US 11 in stockinette sts = 10 x 10 cm / 4'' x 4''. 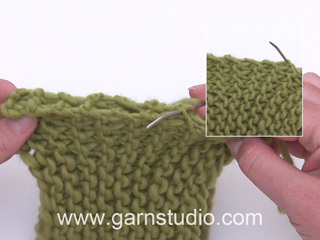 Garter sts (on circular needle): knit 1 round, purl 1 round. Repeat these 2 rounds. Crochet border: 1 sc in first st, *4 ch, 1 dc in first ch, skip approx 3 cm / 1 1/8'', 1 sc in next st*, repeat from *-* and finish with 1 sl st in first sc from beg of round. Cast on 116-128-140 sts on circular needle size 8 mm / US 11 with Fox. Work 4 rounds in garter sts and continue in stockinette sts. When piece measures 21-23-25 cm / 8 1/4"-9"-9 3/4" dec 18-20-20 sts evenly on round = 98-108-120 sts. When piece measures 23-25-27 cm / 9"-9 3/4"-10½" dec 12-14-16 sts evenly, repeat on every 4th round a total of 4 times = 50-52-56 sts. Insert a marker in piece and measure from this point onwards. When piece measures 10 cm / 4'' from marker inc 10-11-11 sts evenly on round. Repeat this inc when piece measures 14 and 18 cm / 5½" and 7" = 80-85-89 sts. When piece measures 50-52-54 cm/19 3/4"-20½"-21 1/4" from casting on edge work 4 rounds in garter sts and then bind off loosely. 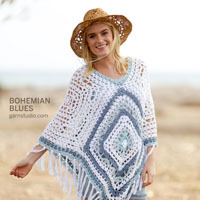 Crochet a border along top and bottom edge with crochet hook size 7 mm/ K/10.5 and Eskimo – see above. 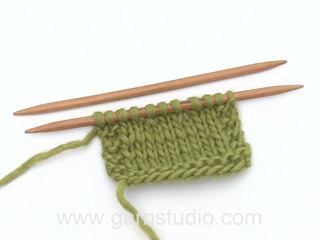 Knitting gauge: 13 sts x 20 rows on needles size 5 mm / US 8 in stockinette sts = 10 x 10 cm / 4'' x 4''. Crochet border: 1 sc in first st, *4 ch, 1 dc in first ch, skip approx 2 cm / 3/4'', 1 sc in next st*, repeat from *-* and finish with 1 sl st in first sc from beg of round. Cast on 26 (30) sts on needle size 5 mm / US 8 with Fox. K4 rows in garter sts and continue in stockinette sts with 3 edge sts each side in garter sts. When piece measures 24 (26) cm / 9½" (10 1/4") K4 rows in garter sts and bind off loosely. Piece measures approx 26 (28) cm / 10 1/4" (11"). Sew tog the side seams. Leave a 4-5 cm / 1½"-2" opening for the thumb, 4 cm / 1½'' from the top. 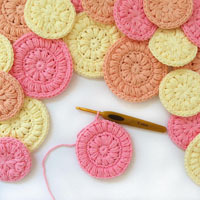 Crochet a border round both ends with crochet hook size 5 mm/ H/8 and Eskimo – see above. Bonjour, je me permets de vous signaler que j'ai relevé quelques "coquilles" dans les explications de ce modèle... Le nombre de maille pour la taille intermédiaire est de 128 (et non 118 si j'ai bien compris) et les indications pour le col devraient comporter des augmentations et non des diminutions (si j'ai toujours bien compris le principe...). Voilà ! En espérant vous avoir aidés avec ce commentaire, je vous félicite pour tout !!! Cordialement, M.
Merci La Grenouille, le modèle a été corrigé. 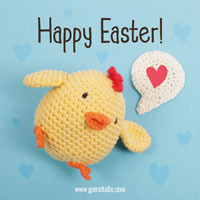 Bon tricot ! Dette er lige, hvad jeg har brug for. Netop de steder, jeg bliver kold indendørs om vinteren. NEJ tak!Jeg foretrækker et sjal.UF!det mixede garn bliver jeg hurtigt træt af at se på.